The Enchanted Circle Trails Plan represents an inventory of current trails and a shared vision for the future. It provides a blueprint for a comprehensive, cohesive, and connected trail systems that can improve quality of life and community health throughout the Enchanted Circle. 1. This plan addresses a wide range of trail types. It includes planning for off-road, natural surface hiking and biking trails; on-road or separated bike lanes; and multiuse paved pathways. All user types are included (walk/hike, road bike, mountain bike, ski, horseback, off-road vehicle, etc.). 2. The trails included in this plan serve a wide range of purposes. Trails that can increase safety for pedestrians and cyclists are a particularly high priority. 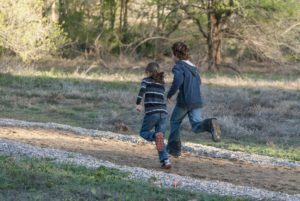 Trails identified as high priority link neighborhoods, schools, and businesses; connect locals and visitors to the iconic landscapes of the region; and provide close-to-home access to the outdoors. 3. This Trails Plan is conceptual. This means it outlines a vision, preliminary priorities, and strategies for implementation, but leaves additional assessment and site-specific planning to the many local jurisdictions, agencies, and community groups in the study area. 4. This Trails Plan is a living document that will evolve over time and can be adapted for local priorities. Along with this report, local partners can use a web tool to analyze proposed trails and further refine their priorities. This plan will evolve over time as community priorities and trail opportunities change. 5. The partners in this Trails Plan respect private property rights. Any trail access through private lands must be well planned and well maintained—and developed through engagement with and respect for landowners. Many of the trails proposed in this plan represent general trail corridors and not specific trail alignments. Specific alignments will always be negotiated with appropriate landowners—including public agencies—and will go through all necessary approval processes. Hundreds of people contributed their time and passion to the Enchanted Circle Trails Plan. Nearly 190 people attended our community meetings, over 20 provided their expertise to our mapping and GIS team, and 30 got out in the field and helped us “groundtruth” proposed trails. Many hundreds more gave us their input through interviews and focus groups, community surveys, and outreach events. 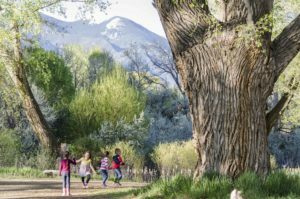 In addition to these community participants, this plan was made possible by generous support from the LOR Foundation; the Town of Taos; Taos County; the National Park Service Rivers, Trails, and Conservation Assistance Program; Taos Land Trust; the Enchanted Circle Trails Association; and The Trust for Public Land. Headwaters Economics also provided valuable survey data on community perspectives and needs. Check out the Marketing Page for this Project.